Enjoy the joy of coloring. Color, de-stress and be creative anywhere you go. Discover a unique artwork collection with 900+ adult coloring pages and experience the perfect way to step back from everyday life. 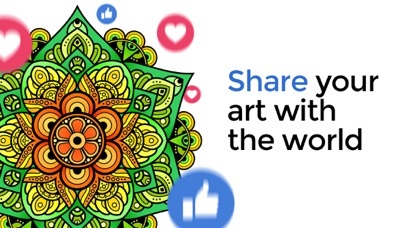 ..it’s proven to help you rest your mind too : ) Share your finished art on your favorite social network and let others enjoy your artistic creation. 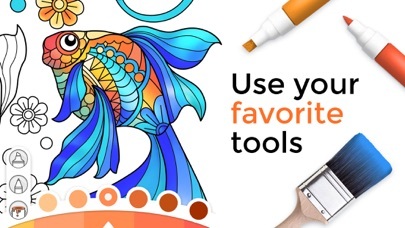 WHY YOU’LL LOVE COLORING BOOK • Gorgeous images with lots of details • Artwork collection library with categories: Animals, Love, Mandalas, Portraits, Sea Creatures, Flowers, Oriental, Ice Cream & Cake • Automatically color within the lines with tap-to-fill • Artist tools variation: Pencil, Marker • Share you art on your favorite social network - Instagram, Facebook, whichever you like best. • Works off-line. No internet connection required • Sound on/off WE LOVE FEEDBACK As always, we appreciate your feedback. 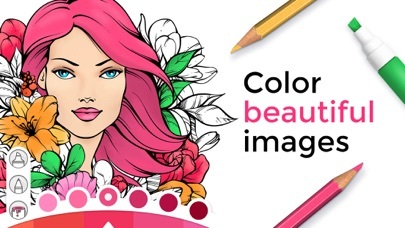 Please keep sharing your experience to feedback@impalastudios.com Enjoying Coloring Book and want more features? Great app, good for after a stressful day! This game is very relaxing. They give you a variety of colors and cool drawings! BEST GAME EVER!! This app would be perfect if it didn’t freeze whenever an ad would play. Also it would be nice if there was an eraser tool. It continually crashes! Don’t get too invested in a piece 😡 I was super excited to download this app because of the great rating, but about five minutes into each picture it freezes and then crashes forfeiting all the work I’ve done in that time. It’s very aggravating, because there’s a great interface and it seems like it’d be an amazing app. Unfortunately the developers need to change something and until then I won’t use it. I’ve tried updating my device but that doesn’t seem to help. This app is wonderful! It allows me to express and create masterpieces! I love it as I am able to relieve stress as I re-direct my energy! I tried out a few coloring apps just now and found flaws in all of them immediately— but not this one! I’m still exploring it, but so far it’s quite enjoyable. Thanks! I have really enjoyed coloring in this app. The colors are great! Would really like more pictures! I especially like the portraits and the mandalas. I haven’t really learned how to do pwn and marker. I just use the paint. Please give us more pictures!